We continue to proofread and add more articles from the old CCGSI website along with some new and interesting facts that we find along the way. If you find something in error on the website or are missing something from the old website, please drop us a line. As always, we are glad to hear from you! 2014 is winding down and soon fall will be here. Most festivals and county fairs are done for the year but there are still a few events on the calendar. The Annual Saline City Labor Day Picnic is scheduled to begin this weekend on Aug 30. Always a good time there with lots going on and lots of Clay County people serving up some wonderful food and entertainment. The Saline City Picnic first started back in the 1930’s be sure and stop in this year for a good time. Center Point Fall Festival: Saturday, September 13th. Festivities begin at noon with lunch. Ham and Beans are served all day. Pappy’s Barbque will provide the evening meal. Free will offerings are accepted for all meals. Celebrate Poland on Saturday September 13th and 14th. Festivities begin at 10:00 AM at the Poland Lions Club Park in Poland. Come to Poland and enjoy food concessions, crafts, flea market items, Live music, weavers, blacksmith, and Bubbles the clown. On Sunday the 14th, guest speaker Mike LUNDSFORD will be speaking at the Poland Chapel at 2:00 PM. Ice Cream will be hosted by Zion United Church of Christ at the Poland Chapel after the presentation. Read more on the town of Poland. The CCGSI website is an ongoing project. As you can see the webpage is growing and will continue to grow in time as we keep finding more stuff that might interest you. The articles from our old website have been moved here and are arranged in the menu to the left. If you have old links to the articles please discard those links and find new ones here. We find the new system is much easier to use. If you can’t find something from the old webpage use the new search feature or drop us a line on the Contact page. We are always glad to hear from you! In the next few weeks we will be adding to the Queries page and adding some old time photos of people and places. Some of the photos will have great information with them and others will need names filled in. We would love it if you could supply any additional information to the Query page or to our page of Photos. We will also be adding pictures to the Gallery so check it out soon as well. Also on the agenda will be additions to the publications for sale page. The Society has many items for the Clay County Genealogist for sale including Clay County History Books, Cemetery Books, Maps, Cd’s, and other supplies. Monies from our sales help to keep our Library open and running. 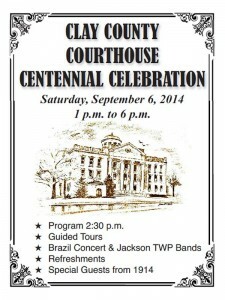 There will be a Centennial Celebration to honor our own Clay County Courthouse on September 6, 2014. 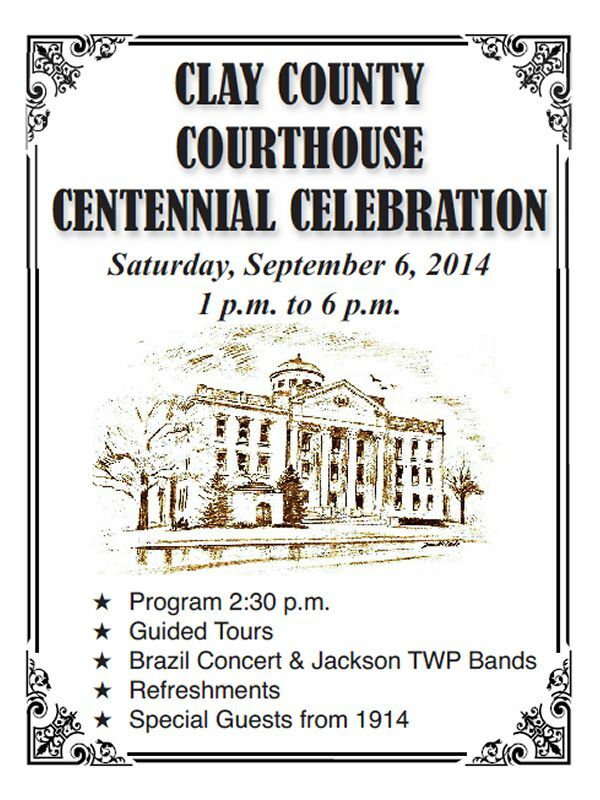 Music, Tours, Refreshments, Souvenir Cups, and Special Guests will be available throughout the afternoon and a Program will be at 2:30 P.M.
You can read more about the celebration here or visit the Clay County Courthouse Centennial website.